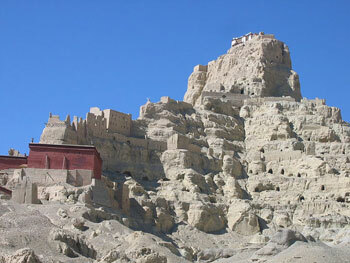 The Kingdom of Guge, founded in 868 and became a focal point for the preservation of Buddhism in Tibet until the 17th century. After the assassination of King Lang Darma in 842 by his own brother, the Buddhism in Tibet was completely snuffed out for nearly 100 years. In 1040, a renowned Indian Master named Atisha arrived in Guge Kingdom and spent some times at Toling Monastery where he created a resurgence of interest in Buddhism which eventually spread all over Tibet. Tsaparang and Toling retained their importance within Western Tibet as political and religious center until the 17th Century. Today, more than 300 years later, all the remains is a huge complex of caves, living quarters and temples, some of it in an excellent state of preservation, the rest in ruins. This place can be visited combining with Mt. Kailash and Lake Manasarovar via either northern route (Shiquanhe) or from southern route via Saga - Paryang and Manasarovar. The tour itinerary can be varied according to the time frame and places you would like to cover within the itinerary. Below, we have designed an itinerary that commences from Lhasa. In Lhasa, we spend a couple of days for sightseeing propose after that we continue our journey to Western Tibet via major highlighted places of central Tibet (Gyantse, Shigatse Sakya etc.). The tour eventually takes us to the Guge Kingdom and toward to Nepla via Zhang-Mu (the Tibetan border town). Day 01: Fly Kathamndu to Lhasa (3650m). Day 04: Lhasa - Gyantse (3650m / 260 Kms). Day 05: Gyantse - Xigatse (3900 / 90 Kms). Day 06: Xigatse – Latse (4000m / 180 Kms). Day 23: Kerung Border and Pick upand drive to Kathmandu. Day 23: Nyalam / Kerung Border and Pick upand drive to Kathmandu.